The over-reactionary nature of Wall Street is well-known. As I once heard someone put it, “A BUNNY FARTED IN SWITZERLAND! SELL! SELL! SELL! !” I could describe it another way, but I’ve never heard the stock market summed up better than that. 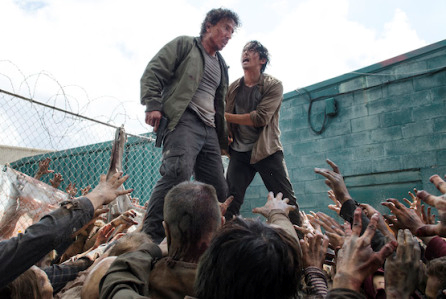 When the new season of The Walking Dead premiered, it was the highest-rated show of the week across all networks. Then NFL football started running opposite TWD, and it became the second highest-rated show of the week. Then the World Series began, and it became the third highest-rated show of the week. Anyone who knows anything about TV realizes whatever goes up against big sports always loses. That’s the way the world works, and how it’s always worked. The goal becomes to lose the least amount, and TWD was still the highest-rated SCRIPTED show of the week. Consequently, AMC’s stock is down, and their CEO, Josh Sapan, was pushed out on a podium to console their stockholders the best he could. He essentially said what I said — that no one wins against sports and TWD did the best it possibly could, literally. While he was up there, he also spoke on the subject of syndicating shows to streaming services, which is becoming controversial among execs because they’re beginning to realize people are watching those services instead of their networks. Time Warner announced it was pulling back on its offerings to Netflix and Hulu because of this. Sapan’s opinion was more in line with reality: you earn the most money by going in the same direction the public is heading, not by trying to fight the current. He has no plans to remove TWD from Netflix, where it remains one of their most streamed shows.